As he was pulling out the 5-year-old’s lifeless body from the sand, he didn’t know what to do. Then it occurred to him that he had once seen a CPR being performed on TV and he decided to act right away. Alyssa Bostic, a happy 5-year-old girl, was joyously playing in the sand at the Marina Dunes when the unthinkable happened. Alyssa had created a small cave during her playtime, and she wanted to try to fit into a small hole to go inside. Unfortunately, when she climbed in, the situation became serious as the sand cave collapsed. With Alyssa stuck inside, there seemed to be little hope for her to escape as she was completely buried in the sand. Another child, 11-year-old Connor Fitz-Gerald, had encountered the same location Alyssa had just gotten trapped in. He had a strange feeling that something wasn’t quite right. Connor witnessed one of Alyssa’s belongings in the sand and had the feeling that she was trapped. With no adults nearby, Connor decided that he needed to immediately take action himself. He tried to think about where her head would be in relation to the hole she dug and decided he needed to free that area of her body first. Once he dug through the sand and pulled Alyssa out, she was unconscious. She had sand packed into her mouth, nose, and eyes. The situation wasn’t looking good for the girl until Connor remembered a television episode of the program NCIS where he witnessed CPR being performed. Because Alyssa was unconscious, he decided his best bet was to try to perform CPS himself. HIs quick thinking saved her life that day. Once Alyssa’s parents came back to the area, they were shocked but called 911 immediately. The paramedics on scene noted that if Connor hadn’t taken action, Alyssa’s circumstances would have been fatal. Fortunately, the little girl has since made a full recovery back to health. Connor’s father is extremely proud of his actions and is thankful that the situation had a happy outcome. Connor’s bravery and determination saved a life on the beach that day. His mindset and admirable actions were crucial to this little girl’s survival. Although this mistake could happen to anyone, it’s important to remember safety when playing on the beach, as sand collapses easily and accidents can occur. 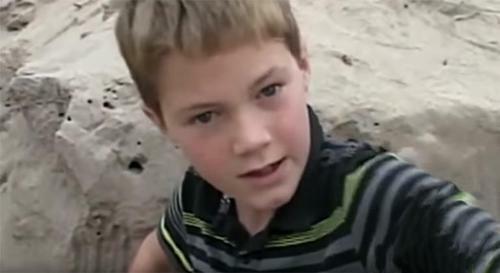 We are so glad that Connor with his amazing survival skills acted fast that day and trusted his natural instincts. He is the hero we all need watching out for us. How far would you go to save someone you thought was in trouble?